We have exactly two chickens remaining. 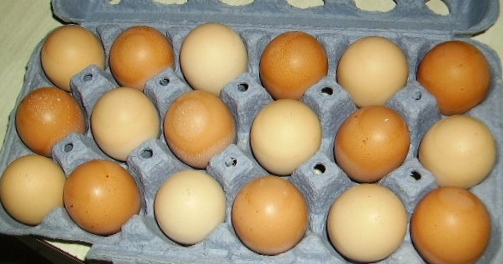 One lays speckled, dark brown eggs. The other lays creamy tan eggs. They each lay an egg almost daily. However, in the egg carton, we find all the eggs arranged artistically. The Egg Gatherer is not an artistic person; he’s mathematical and scientific, by nature. But he arranges the eggs artistically into the carton, because the Egg User is artistic. He says not a word about this tiny surprise he has prepared for the Egg User. This, after over 42 years of marriage. Totally amazed in a delightful way, is what she was. We’re getting a lot of eggs right now from our hens. I’m just happy to see them coming inside 😉 I know the other mom feels the same way (they have close to 30 I think, now)…though I don’t know how she’s shelling out .25 per egg! Too rich for my blood! Nice! Abigail gathered eggs for our neighbors while they were gone a week. The hens that laid white eggs laid on one side of the box. The ones that laid brown eggs laid them on the OTHER SIDE of the pen. Amazing. In our house we have a two-step egg collection process. The Chief Egg Gatherer collects them and leaves them by the kitchen sink. The Assistant Egg Gatherer washes the eggs and puts them into the fridge. No matter how you divvy up the task, it’s great to have fresh eggs daily. Glad to find you again. beautiful! Nothing better than fresh eggs for eating and for appreciating the colors! So true, Sarah! Thanks for this comment and Welcome to The Conquering Mom! beautiful piece! I would SO love having fresh eggs daily, but haven’t gotten around to figuring out how to care for chickens. ohmygoodness – what a story! I am giving raising chickens more than a second thought here. 🙂 Maybe I’ll just continue getting fresh eggs from our friends!! Pingback: $aving of the Green – Blog Carnival | Home's Cool!